NEW YORK (CNN) -- Prince Harry, the younger son of Britain's Prince Charles and Princess Diana, offered his condolences to September 11 victims Friday in his first official trip overseas. 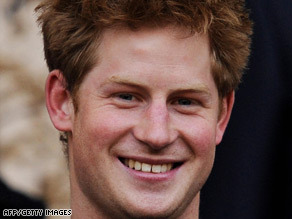 Prince Harry, 24, the third in line to Britain's throne, is making his first official trip overseas. Harry's two-day visit to New York, surrounded by public officials and community activists, could reflect a change in a public image that has been marred by several incidents, including a one-day stint in drug rehab in 2002 and accusations of racism in January. At the outset of his visit, Harry stopped at ground zero with New York Gov. David Paterson and briefly talked with family members of September 11 victims. The prince then laid a wreath at the World Trade Center site and bowed his head in a moment of silence. Harry's trip will also take him uptown to the Harlem Children's Zone, where he and Prince Seeiso of Lesotho hope to learn how the nonprofit has succeeded in supporting children in the low-income area, officials said. Following the example of his mother, Harry will use this trip to promote his own charity for children, Sentebale. Co-founded with Lesotho's prince, the charity supports children in the sub-Saharan country who lost parents to AIDS. Also on Harry's agenda is a meeting with veterans of the Iraq and Afghan wars, officials said. Harry, 24, served for two months in Afghanistan as a Coalition Forces soldier in 2007. The third in line for the British crown, Harry is active in the British Army. He received a promotion to lieutenant in April 2008 and is training for an Army Air Corps pilot position, according to the prince's Web site.